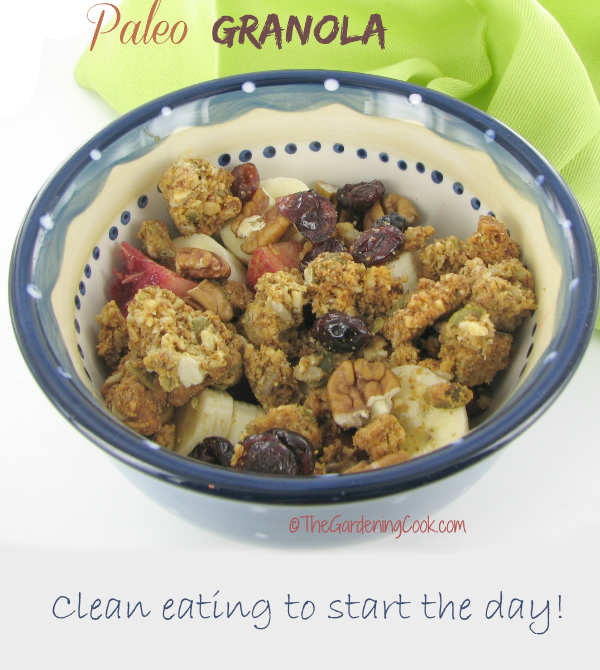 Start your day with Paleo Granola. Paleo eating seems to be all the rage right now. It is hard to open a magazine, look on a Twitter feed, or log into Facebook without hearing something about the diet and how good it is for you. Some think that it is very restrictive, while others embrace it. For those of you who think that you will have to give up flavor and taste, think again. This Paleo Granola recipe is better than any of the non Paleo granolas from the store but it is chock full of goodness and tastes just wonderful! 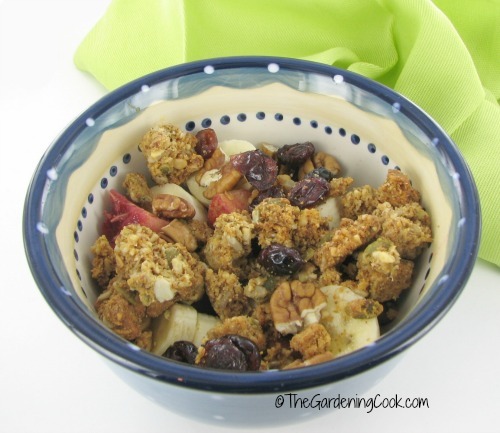 The base of this granola recipe comes from two products that I recently discovered – Original grainless granola, and Steve’s Paleo dried Cranberries. 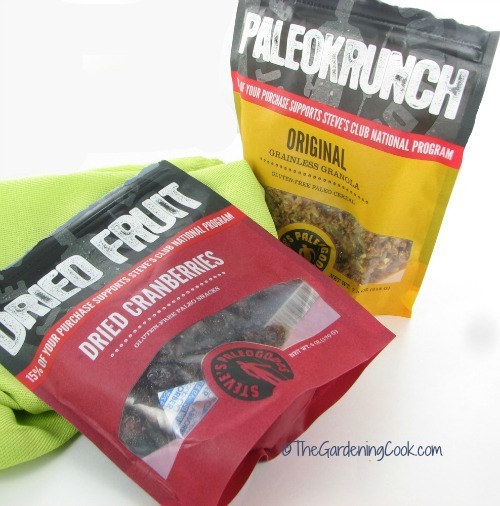 Both products can be found on Steve’s Paleo goods and I really recommend them. (affiliate link) The granola on it’s own is dangerous! I could it a whole bag of it as a snack in one sitting, it is that good! The granola is a wonderful mix of raw almonds, shredded coconut, raw sunflower seeds, raw pumpkin seeds, coconut oil, honey and vanilla extract. Notice anything in the list? Not a chemical in the bunch! Anyone who has eaten granola, knows that it is super tasty, but the serving size is tiny. 1.5 ounces doesn’t go far. I don’t know about you, but for me, part of feeling full comes from my eyes, so I like to plump out recipes with healthy ingredients that will make me feel fuller emotionally. To do this I added some walnuts. 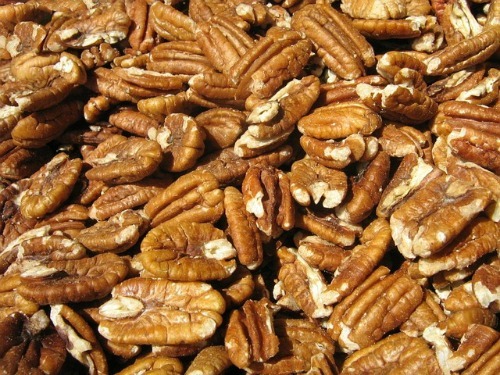 Walnuts are Paleo, but you have to limit them if watching your weight is an issue for you. I added 5 halves to my mixture and broke them in half again. Since I am already using 1/2 ounce of dried cranberries, which tend to be high in calories, I wanted to add some fresh fruit to my mixture to bulk it out without adding too many extra calories. For me it was a very small banana and a small nectarine that needed eating. 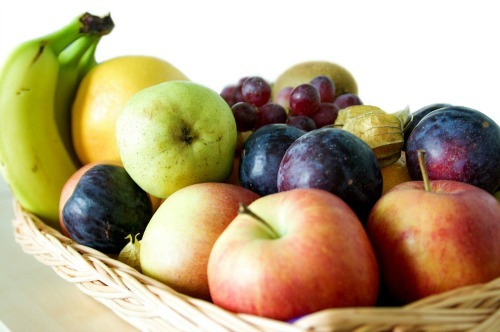 But any fresh fruit will do. See the dried cranberries here. See the wheat less granola here. Combine all of the ingredients. Mix well and place in a large bowl and enjoy.